Many years ago, Mike Flores wrote an article titled “Who’s the Beatdown?” and the theory contained within this piece has been referenced time and again for nearly two decades. If you want to be successful at competitive Magic, you have to understand how to assign your role in a given matchup. This is no less true in Modern. The very first line in Flores’ piece should resonate strongly with experienced Modern players: “The most common (yet subtle, yet disastrous) mistake I see in tournament Magic is the misassignment of who is the beatdown deck and who is the control deck in a similar deck vs. similar deck matchup.” Similar deck vs. similar deck, eh? There is no shortage of examples of this in Modern, and in my experience it’s quite common to see players misunderstand their role in aggressive mirrors. Many players are inclined to beatdown whenever possible, because intuitively it just makes sense for aggressive decks to be aggressive. There are also decks on the controlling side though, and there is no shortage of ways to incorrectly assign your role in a match of Modern. The concept that will help you identify your role more than any other, is that of the fundamental turn—another concept from a classic Magic article, this one by Zvi Mowshowitz. Important questions to ask are what each player’s fundamental turn is, the way in which each player attempts to slow the other down, and what the fundamental turns are adjusted for interaction. If their fundamental turn is realistically faster, that will almost always mean that you should play the control. To illustrate this point, let’s take a pretty clear-cut matchup as an example. In the matchup between Infect and Valakut decks, Infect very clearly has a faster fundamental turn, and little in the way of meaningful interaction with the Valakut gameplan. Technically, both of these decks can kill on turn three. Valakut has access to the line of Search for Tomorrow, any two-mana ramp spell, and Through the Breach, but Infect is dramatically more likely to pull off a kill at this rate. Valakut decks are generally turn-four-to-five decks, and Infect is a turn-three-to-four deck. Infect could in theory have access to a lot of cards that are quite powerful against Valakut, such as Spell Snare and Mana Leak, though these cards are generally reserved for controlling roles. Instead, Infect chooses to battle with Spell Pierce. Technically, you can Pierce a Breach and turn off the opposing nut draw, but the Pierces are really there to fight off the tools that the Valakut deck utilizes to slow Infect down, such as Lightning Bolt and Anger of the Gods. Flexibility is nice and all, but as the Infect player you need to identify what purpose the Spell Pierce is supposed to serve in your opening hand. Clearly you want to pivot if you need to counter a Breach, but for the most part it is a tool to facilitate your aggression. In most situations, if you are using your Pierce to counter a Farseek you are misunderstanding the fundamental nature of the matchup. They’re already slower than you, and as such you only need to slow them down if they are actually threatening to win the game. Knowing that you’re playing a turn-three deck against a turn-four deck is a great place to start, though Magic is far from that easy. Once you can identify the fundamental turn of a given hand and feel out your opponent’s fundamental turn from their early sequencing, then you’ll really be on to something. The truth is that most matchups aren’t as clear-cut as Infect vs. Valakut. To tackle something from the opposite end of the spectrum, abstract knowledge won’t get you very far when playing Burn vs. Death’s Shadow Zoo. If you can’t properly envision what the game looks like at least two turns out, you will be in serious trouble in that matchup. As you both attempt to execute your game plan, you must ask how much you are enabling the other player. Should you pay life for that Gitaxian Probe? Am I supposed to cast Lava Spike this turn, or sandbag it to kill them from nine? The Probes will make the life of the Death’s Shadow player a little easier, though in these high-context matchups you will need to constantly assess who’s the beatdown on literally every turn of the game. Technically Burn is shoe-horned into a controlling role in an abstract sense given the relative explosiveness of Death’s Shadow, but you’ll never be great at Magic if you only assign your role once per game. Against all three of our opposing decks the Grixis Delver player should generally assume a controlling role, though it plays this role extremely differently in each matchups. While these three decks are all quite different, Grixis has ways to play similarly to all of them, which is what makes the assignment of your role as the Grixis Delver player quite complicated across the board. Against Infect you have to be extremely efficient, against Jund you have some time to mess around as long as you don’t play right into a Liliana of the Veil, and against Jeskai the most important thing is really just making land drops for a while. Let’s check out some sample hands. Note that you sideboard differently against all of these decks, so these will all be game-one hands. It’s not perfect, but it’s illustrative. This hand simply won’t cut it against Infect. You have one, maybe two Blighted Agents covered, but you are flat dead to Glistener Elf or Inkmoth Nexus without so much as a Serum Visions to help draw you out of it. Against Jund I could see this hand winning games. The games generally go long, though if they have a Thoughtseize they probably run you over. It’s on the low side of hands, but it’s not a non-starter. Against Jeskai though, this hand is kind of the nut. They’re not going to just run a Nahiri into counter mana, and making land drops will allow you to effectively cast the spells you draw by the time you need to, which is generally pretty late in the game in this matchup. This hand is great against Infect and Jund. They are both, at their core, creature decks, so this hand has plenty of relevant interaction. You even have a Mana Leak for any Liliana woes! The Delver is flexible against Infect either to pressure them to play into your removal spells or to block their creatures. Against Jeskai though, this hand is going to struggle. Terminate is close to a mulligan, there’s no guarantee that you even hit your third land drop, and your Delver is going to die. I think the hand is on the low side of keepable against Jeskai, though in that matchup you need to draw great to win while against the other two decks you could realistically brick for a while. For our last example, we have a hand that gives us the bare minimum that we need against Infect. You can interact with anything, though you can’t really fight battles on the stack. There are enough tools to slow their plan down, but you’re land-heavy and probably need to draw spells rather quickly. Against Jeskai, this hand has land drops, an answer to an opposing Snapcaster Mage, and a Snapcaster of its own, which is a solid place to be. This hand will struggle a bit against Jund though. A discard spell makes this hand fairly easy to dissect, and even without one, two Tarmogoyfs and/or a Liliana will put pressure on the top of your deck to deliver. The role that the other player assumes, or wants to assume, is important here too. Infect is the beatdown, Jund is the beatdown, and Jeskai is also trying to assume the control. As you can see, when your opponent is trying to assume the role of the beatdown and you are trying to play the control, you have to be a lot more strict in the assessment of your opening hand with regard to their fundamental turn. Jund doesn’t necessarily kill very quickly, though it does present turn-two Tarmogoyf and turn-three Liliana to attempt to put Grixis Delver on the back foot early on. When both players are trying to assume the control, there is a tension in the matchup that revolves around who can do nothing longer. 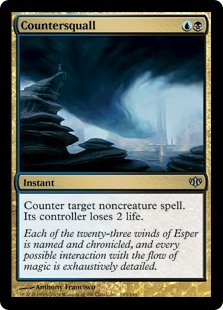 If they start casting counterable Nahiris, I can start using Snapcaster Mages to both react and apply pressure. If I start casting early Delvers, they can leverage their Snapcasters and Nahiris in much the same way. Similarly, against Jund if I try to assume the role of the beatdown, they are allowed to leverage their cards in a much more relevant way against me. The more aggressive that I get with my Snapcaster Mages and Kolaghan’s Commands, the more they’re able to bury me with a Liliana or Kolaghan’s Command of their own. Realistically, the role they want to assume is the control, but if I play correctly they are forced into being the beatdown. It’s less pronounced than it is in the Jeskai matchup, though the same principle of not aggressively pushing your chips in and biding your time will be beneficial in this matchup. If you are effectively able to play the role that your opponent wants to play in a matchup, you will be fundamentally advantaged. Similar to the way that having a slower fundamental turn means that I can’t be the aggro, if your deck is able to play a longer game than my deck I will be in trouble if I try to play the control. Assessing opening hands for assuming the role of the beatdown is much easier, as a hand with a reasonable mana curve is generally keepable. What you’ll want to be mindful of is what sorts of interaction your opponent is likely to have that could mess up your role. For example, Infect is generally going to be the aggressor, but a hand with a clock and some answers to disruption that’s reliant on a Noble Hierarch surviving—because it’s a one-lander, say—isn’t going to cut it against the Lightning Bolt decks of the format. The best cards for being flexible in your role do two things for the price of one. Think cards like Searing Blaze, Countersquall, and Kitchen Finks. An interactive spell that damages the opponent is great whether you’re the beatdown or the control, and a well-sized creature that gains life and has a sticky ability is likewise solid at executing both controlling and aggressive gameplans. The mistake that players will commonly make with access to these cards is valuing one of the facets of the card too highly. It’s true that Kitchen Finks is a great blocker against Burn, but it’s important to know when it’s correct to shove. If your Burn opponent has just been casting spells and hasn’t been committing creatures, you should be worried about dying on the stack. Playing around Goblin Guide is generally smart, but you’ll also have to recognize when you need to prioritize removing your opponent from the game. The improper sideboarding that I see with Delver strategies is completely heinous. Sometimes you are the beatdown when Countersquall is in your deck, but the fact that it shocks your opponent does not mean that you can keep Delvers in against URx control decks. It’s a counter with upside, not a burn spell with upside. Don’t get distracted by one side of a card that can fulfill multiple roles—take advantage of the entire textbox. There are a ton of “hoser” cards available in Modern, offering players the opportunity to incorrectly assign themselves as the control and throw away matches on the deck registration sheet. I frequently find myself discussing incorrect sideboarding from Burn players. The volume of one-dimensional cards in the deck mean it’s almost always the beatdown, yet almost every sideboard I see Burn players register biases towards a controlling role where it is simply wrong to do so. I have never been convinced that a Burn player with Rest in Peace in their sideboard is doing it right. When I think of the graveyard decks in the format that demand hate, Dredge and Goryo’s Vengeance are what come to mind. Against Dredge RiP doesn’t work for a couple reasons. The first is that they can often recur multiple creatures from their graveyard on turn two, and indeed the deck mulligans to hands that are capable of this whenever possible. The other is that Burn is just advantaged with regard to the fundamental turn, and realistically the only games that Dredge is winning before that point involve hands that go under Rest in Peace in the first place! Goryo’s Vengeance is a messier matter, as the deck threatens to win the game on turn three. The problem here is that you can expect your Goryo’s opponent to just Through the Breach you, which makes your Rest in Peace a mulligan, and theoretically one that cost you the game by pushing back your fundamental turn! With few exceptions, Burn should just sideboard cards that deal damage. Deflecting Palm is a more potent tool against these decks, though another one to be wary of. Even with Palm, you’re not the control deck. One Palm doesn’t necessarily win the game, given their discard spells and counters, and drawing multiple Palms will also be akin to mulliganing with regard to executing your beatdown plan. I like one Palm as a gotcha card, though really you just have to be the beatdown for the best chance of winning, and I have never been convinced that more than one copy in your 75 could possibly be correct. Another common sideboarding mistake I see is from newer Affinity players. Affinity will usually be facing down some manner of hate card that it needs to counter-sideboard against, but the worst thing you can do as an Affinity player is over-sideboard. Your list should be mapped to bring in approximately three cards in any given matchup, because there is no way that your Signal Pest/Memnite deck is going to be playing the control very often. You bring in enough stuff so that your opening hand is either just a nut Affinity opener or a hand with one piece of solid disruption. Sideboarding too much makes it more likely to fan out a controlling opener that topdecks Ornithopters. The better you understand your role in sideboarded games, the better you’ll be able to construct your sideboard. Nearly every player who complains that Modern as a format taxes sideboards too heavily isn’t executing the principles in this piece well. A well-built Modern sideboard is something of a unicorn, and I believe that the knowledge necessary to fix these mismanaged sideboards has been available in a 17-year-old article all along. Mastering Modern is a matter of knowing your role, knowing the tools necessary to execute your role, and constructing a 75 that facilitates this execution. Magic has changed a great deal since the writing of “Who’s the Beatdown?” though many of the fundamentals have remained the same. And there’s no substitute for good fundamentals. Hey, great article, one thing I don’t necessarily agree with is your idea of how few cards an affinity player can board in a given matchup, between etched champion and cards to beat the hate we have multiple relevant cards that massively impact the post board matchup considering the power of stony silence, and more importantly we have galvantic blasts/thoughtcast that can come out without any harm to the decks engine and that’s 3-4 cards already. From there it’s not a problem to replace a couple artifact creatures that are poorly positioned for etched and a hate card and the deck will still function the same, it has a really high level of redundancy. It depends on your build, right? If you have a bunch of Galvanic Blasts, sure. This remark is more aimed at people who are asking how many Arcbound Ravagers they should shave.